No Session Minutes prior to 1909; no Board of Mananagement Minutes, Baptism or Communion rolls prior to 1907. Foxton Church damaged by fire in 1912. 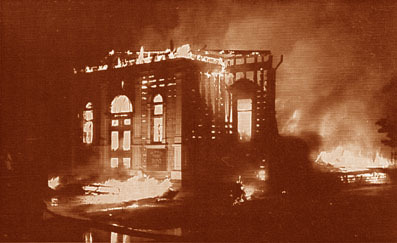 As the building survived many more years it would appear that the fire was well contained. Although the Rev James Duncan of Foxton, who was appointed to this area in 1861, 'officially' retired in 1897 he continued to act as the Foxton Minister, preaching fortnightly and strictly regulating the activities of any visiting Student Preachers. The congregation had by this time dwindled to just a few Parishioners. It is known that one year before his death in 1908 the Rev James Duncan requested his daughter to destroy all of his personal papers. As the Parish records would also have been in his possession these too may have been destroyed at that time or after his death. It seems more likely that any Parish records that may have existed prior to 1908 were destroyed at this time rather than in the Church fire of 1912. The Church, which had only been opened in 1964, was destroyed by fire on the 10th March 1968 (arson). The Parish have confirmed to us that no records were lost. No Board of Manager's minutes 1926 to 1938 (noted as missing in 1954). The first reference to a Women's group in the Parish is a minute book commencing 14th July 1910, however this meeting makes reference to earlier minutes for which no minute book survives. Robert N Greig, 27.3.1916; William Laing, 1.10.1916; James Pollock 19.9.1906; Annie W Stewart, 13.1.1911; Francis E Ingram, 19.10.1912; James Smellie; and "In recognition of the brave men of this congregation who answered duty's call during the European War 1914-18". The Parish have decided to install a plaque in the current Church to replace the above memorials lost to history (2002). The wooden Church building was destroyed by fire on the 15th April 1966 (arson). The wooden Church Hall was so badly damaged in a fire on the 5th September 1969 that it had to be demolished (arson). The Parish has confirmed that all the Church records dating back to 1885 had been stored off-site and are thankfully intact. A return from 1931 states that "Early records cannot be found". It appears that any early records have subsequently never been located. The only record held for Shannon as at 1990 is a Communion Register commencing in 1936. Shannon is noted as being a Home Mission Station from at least 1901. An unspecified fire in 1930 caused £64 pounds worth of damage.